Looking upstream, beyond here the ohio river confluence is located . Spending till 1400 hrs at the motel was a great opportunity to catch up on my journal entries. Leaving the place I had a meal at the only diner in town. These bloody chiggers are now so bad my ankles and calf muscles are covered in scabs. Everyone has a different remedy. The girl in the cafe offered a salt slurry rubbed onto the scabs as a solution. Not for me I thought. Wickliffe was a small town, with a pharmacy, servo, dollar general, supermarket, car parts place and little else. Needing camp stove fuel and tube patches I visited each place with success at finding a patch kit at the car parts store. Chiggarid was bought at the pharmacy, this turned out to be glorified clear nail polish. The pharmascist informed me that they were common this year due to the flooding among other things. This stuff was applied onsite, anything to stop the itching. At the car part shop there were a heap of staff hanging about. I gave them a volley of words joking about their good job. Yakking with them about all sorts of stuff, one of the guys offered to drive me to Belmont State Park in Columbus, some 25 miles away. The time was now 1600hrs, slackness had set in, the chiggers were sapping me. I accepted his offer. Brad lived out this way so it was not to far off his route home . We loaded up his pickup and headed off. He had just bought a homme for $70000 in a nice area of Columbus and was remodelling it as it is known here. Kindly Brad dropped me off right at my chosen campsite. The Belmont State Park has historical significance in that it was where the confederates controlled the MR from here south. 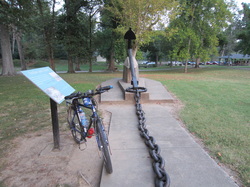 They had a chain spanning the river secured on both sides with huge buried anchors, each link weighed 20lbs. This was to hinder Union shipping. 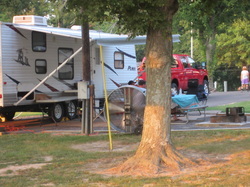 As it was Labour Day weekend the park was full with RV’s, “houses on wheels”, air conditioners, satellite dishes and either confederate or the stars and stripes flags were on display. I found a spot on the grass next to a camp table and set up. Having a cruise about before dark revealed that this area was significant in the civil war. Kentucky was neutral during this event. From here south it was confederate country. 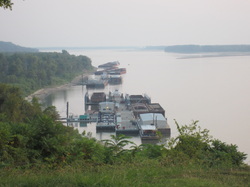 The park was located on a bluff high above the MR, it offered great views of west Kentucky in the background with the river casting a line through the foreground. Barges were nosed into the river banks being held there by their tug boats, presumably for the weekend. The sunset in the background of this scene offered a perfect atmosphere for some timeout on a park seat. Following a shower. It was another sweaty night in the palace. These parks have great facilities, with air coditioned showers that are not heavily utilised as most people have all these amenities in their RV’s.